Following is the list of best selling top 10 cricket helmets available in Indian market. 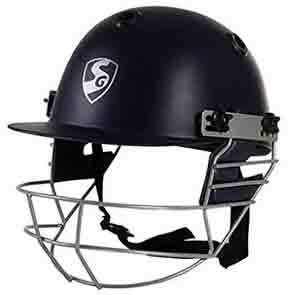 We also review each of these cricket helmets available online at low price. You can get a decent cricket helmet under 1000 rupees. Lets also have a look at helmets from top brands, helmets used by top players, and buyers guide. Why is wearing a helmet while playing cricket important? Some players are reluctant to wear helmet but helmets protect your head by avoiding head injuries. 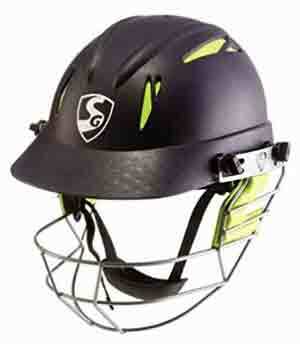 Therefore helmets were introduced in Cricket for advanced safety of players. And it is now official safety standards of cricket, like using gloves, pads etc. How should a cricket helmet fit ? Helmet should feel firm and comfortable with no excessive movement in any direction. Important things to keep in mind while selecting a helmet are; comfort, correct size and quality. When buying for kids/junior players, padding need to fit exactly and chin strap should not be too loose. Different Colour options are available but most common colour is blue / black. 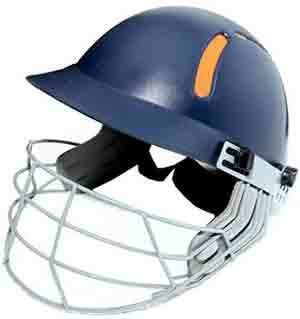 Main parts of parts of a helmet used by cricket players are – shell, grill, padding and chin strap. These parts are made helmet made of various materials such as, ABA glass, fibre glass, carbon fibre, steel, titanium, high density foam etc. Materials used may vary depending upon price range. Make materials also defines the quality, weight and comfort. Therefore by spending more you can get more light weight, comfortable and high quality helmets. These are comfortable to wear for long time. 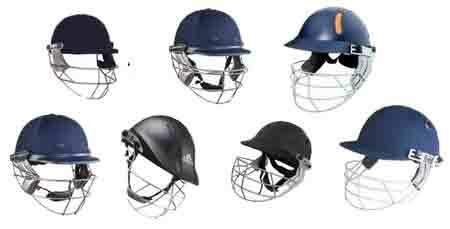 So which is the best cricket helmet for you? That definitely depends on many factors like your age, your budget, playing level, head size etc . For selecting cricket helmet first you have to find out correct helmet size. 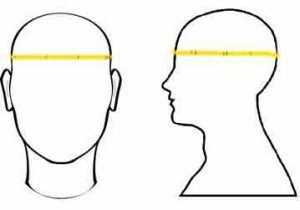 Measure circumference of head just above top of ears, as shown in the image. Then make use of cricket helmet chart, size chart is also available from respective brands. Or you can buy from a local store; you may ask for help from your coach or senior players. ICC recently (jan 2017) announced new regulations for helmet safety. This includes use of British Standard BS7928:2013 (BSS) compliant helmets. These are helmets with narrower gap between the peak and grille. Helmets in this category are for junior players below 10 ,11, 12 year old. This is a cheap one from AADIZ Brand for players in an age group of 10 to 15 years old. You can get this for INR 500 or below. Inner padding is made with foam cushioning and outer shell with high impact resistant nylon material. Grill is made with steel material. Extra Small Size for small boys and girls. 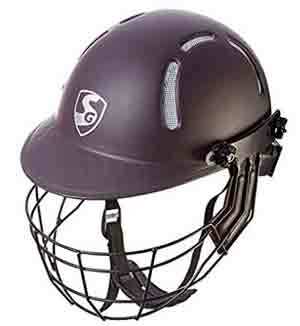 Made with polypropylene, this helmet is perfect for young players in 12 to 15 age group. Brand name – SG (Sanspareils Greenlands). This helmet is available in different size options like for small, very small and large sizes. This is a branded helmet and is available at a price range of 1000 to 2000 rupees. Features gardened and powder coated steel grill, high impact resistant polystyrene and with comfortable inner mesh material and sic air circulation vents. This one is also form SG, available in small and large sizes.This helmet also features parts made with high quality materials for advanced comfort, safety and ventilation. Inner lining is designed for extra breathability and sweat absorption. This helmet features high impact Polypropylene shell and steel grill is fully adjustable. Made with protective impact resistant outer materials and sweat absorbent breathable inner padding. Next post: Are fake yonex rackets good ? Identifying fake rackets.